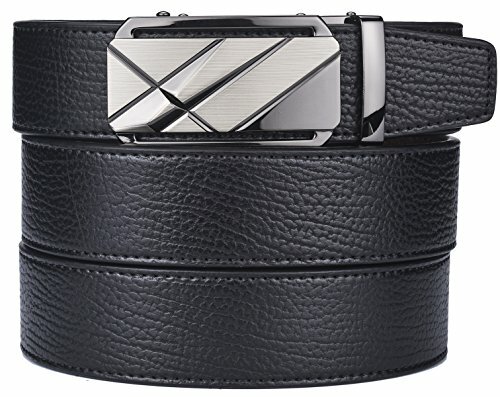 plyesxale Luxury Series Leather Belt with Automatic Buckle Ratchet Belts for Men - Perfect for Dress Pants, Jeans, Chinos, Trousers . 1. Store in a dry, ventilated area. 2. Clean belt with soft fabric. 3. To avoid wrinkling, don't roll up the belt. Store flat if possible. 4. Regular care for your belt will keep it looking new for years to come. 5. Don't expose leather to direct sunlight, extreme heat, or cold temperatures.Doing so will cause the belt to expand and contract unnecessarily. What You Get:1*belt,1*logo printed box,our worry-free 60-days 100% satisfaction guarantee and friendly customer service. ✔ NO MORE HOLES - the ratchet system adjusts in small increments rather than like a regular belt with holes every inch or so which provide the perfect fit. Easy removable buckle allows you to cut the belt to your ideal size to give a primmer and custom tailored appearance! ✔ EASY USE - Just slide the belt into the buckle and pull the belt through, the buckle simply auto locks the belt, to RELEASE THE BELT, gently push the lever on the side of the buckle and lock will snap. Simple, smooth and sleek! Once you get the hang of it, super easy. More secure than a normal belt. ✔ DURABILITY - The plyesxale ratchet belt is crafted from genuine quality leather and complimented with a scratch-resistant elegant buckle. Highest Quality Men leather belts. ✔ GIFT BOX - Make a big impression! It comes in an attractive box,Perfect for gifting, or just because. ✔ ORDER WITH GRACE - If you are looking for the best leather belt, just add the plyesxale fashion belt to your cart, its 100% satisfaction guaranteed, with a 60 days free exchange and return policy as long it's still in brand new condition. If you have any questions about this product by plyesxale, contact us by completing and submitting the form below. If you are looking for a specif part number, please include it with your message.